SYSCO | Would John Eat It? 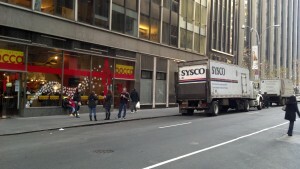 I walked a little more and realized that this was a “SYSCO” truck. SYSCO is one of those large companies that sells mass-produced GMO laden food “products” to restaurants. Basically, if you see one of these trucks making a delivery to a restaurant, well, then that answers your question as to where they get their food “products”. Think that fancy/expensive steakhouse sells you grass-fed pasteured meat? 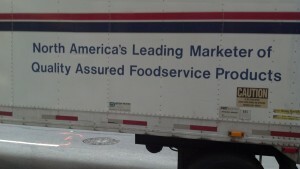 I don’t know, but I do know that the place I saw this truck doesn’t sell anything good. I have installed the NextGEN Gallery Plugin for WordPress, once I figure out how to use it I will make it public so that all readers of this blog can post photos of food service delivery trucks as they spot them in their home towns. My advice is that you take two pictures of the truck with the restaurant in the background, that way nobody can say the car wasn’t parked outside but merely “driving by”. This entry was posted in SYSCO on December 18, 2012 by John.